We don't have a big garden, but we DO have tomatoes and herbs, which is enough to make my garden-vegetable-loving heart very happy. One of my favorite things to make is bruschetta topping, and it's so simple. It makes a wonderful appetizer or a great lunch for a busy mom. The term bruschetta (pronounced broo-sket-ta, by the way; the "ch" in Italian makes the hard "k" sound) actually applies to the roasted bread. The bread in Italy is so good; it's easy to imagine that people would have found creative ways to use day-old bread. Slices of bread are usually rubbed with a bit of olive oil and garlic, and the bread is delicious on its own. But with a topping made from fresh tomatoes, it's heavenly! We ordered bruschetta at several restaurants in Rome this summer, and I was pleased to see that my homemade version stacked up quite favorably compared to theirs. Stir garlic into tomatoes. Add salt and pepper to taste. Drizzle in olive oil. Gently fold in chopped basil. Add a little more olive oil, salt, or pepper if needed. Serve with roasted slices of bread. Enjoy! **Do you love fresh tomatoes and basil as much as I do? What do you make with them? That looks so good Richella! I don't think I've ever had bruschetta before, but this makes me want to try it! I've always wondered how to make this. I'm trying this tonight because a nice gentleman from our church brought us a bunch of tomatoes last night. Yea! This sounds really good. Especially if it tastes like some you tried in Rome. I love appetizers that are healthy and delicious. 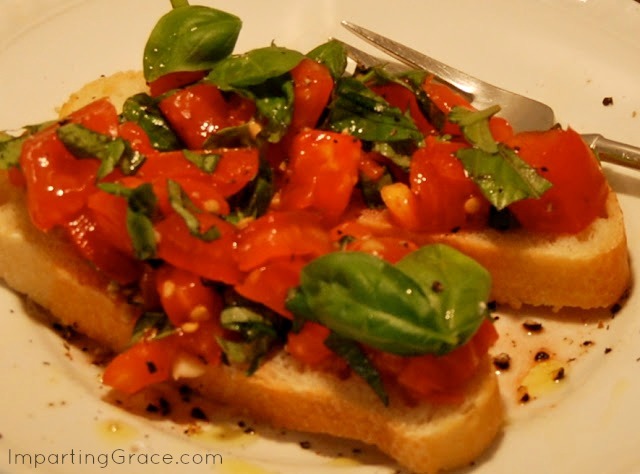 I have had bruschetta on my mind too this year, after our trip to Italy in June. I wrote a post about it and the great Bruschetta Quest. Here's a link if you're interested! I love bruschetta. Sooooooo good. I love to make this, too....and I also like to broil it with a little bit of tomato/basil cheese..mmm good! Growing up, we used to have fresh tomatoes as our vegetable at dinner; they were topped either with mayonaisse or salt. Now I'm kind of grossed out by the thought of mayo on a fresh tomato but would like a drizzle of olive oil and balsamic vinegar and a pinch of kosher salt. Mmmm... hungry for some now but our neighbor with the tomato garden is on vacation and the farmer's market is closed! I adore bruschetta and haven't had it in a good while. I noticed last night that we finally have some ripe tomatoes, so I'll have to make some this week or weekend. Basil, tomato, and garlic are so good together! 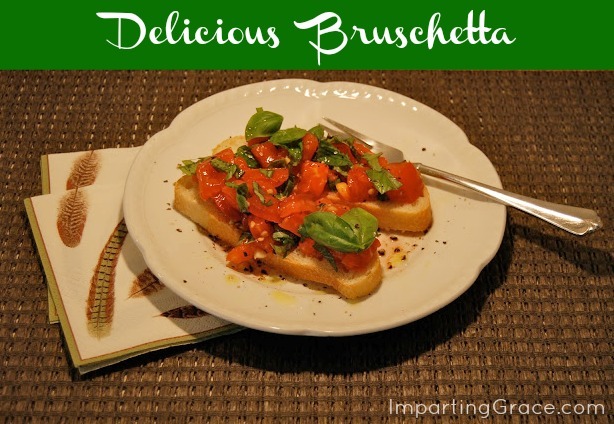 I LOVE fresh bruschetta, and that's exactly how I make it! If I'm feeling creative, sometimes I'll drizzle it with a little balsamic vinegar and some shaved Parmigiano Regiano. Mmmmmm.